Some of the stories discussed on this show will be available on The Pilot’s and The Anchor’s websites on Friday morning (The Pilot) or on Monday (The Anchor). Please check those sites for the latest links. A summary of today’s show: Scot, Susan, Fr. 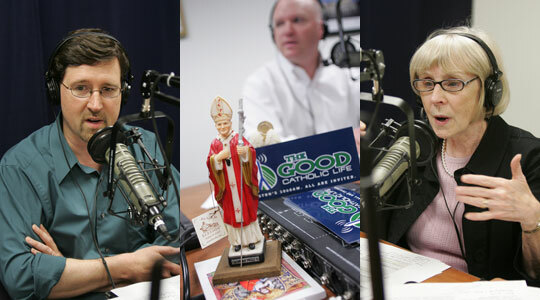 Roger, and Gregory discuss the priestly ordination Mass in Boston this past week; misinformation about a Catholic school closing in Lawrence; more analysis of the John Jay College report on the abuse crisis; Pope Benedict talking to astronauts in space; and more. 1st segment: Scot welcomes Susan back to the show. She was in Atlanta this week for the National Association for Catechetical Media Professionals meeting. Scot today met in a cabinet meeting in which Msgr. Bill Fay updated Cardinal Seán and the cabinet on the work of a committee considering pastoral planning for the archdiocese. The commission has 17 or 18 members who have been getting to know one another and the hard work that has been done already on pastoral planning in the archdiocese. They are working on getting us from where we are today to where we want to be in 10 years. Msgr. Fay used to be general secretary of the US Bishops Conference and is now pastor at St. Columbkille’s in Brighton. 2nd segment: Scot welcomes Gregory and Fr. Roger back to the show. The cover story of The Pilot this week is on the ordination Mass this week in which six men were ordained: Rev. John Anthony D’Arpino, Rev. Michael Joseph Farrell, Rev. Kwang Hyun Lee, Rev. Mark William Murphy, Rev. Carlos David Suarez, and Rev. Sean Patrick Hurley, FPO. Gregory said the Mass began and the weather was gloomy and much like March and by the end it was May again with sun and warmth, which was an analogy for the day for these men. Gregory said it’s like having six weddings at one time. Instead of one powerful moment, there is six. It was an unusual ceremony in that all the men studied at St. John’s. In other years, there can be those from Bl. John XXIII, Redemptoris Mater, or the Pontifical North American College. Susan said the ceremony is so moving and filled with rich imagery and language. Susan pointed out that there are some wonderful ordination photos by George Martell in the public places in the Pastoral Center. Scot was able to watch the rebroadcast of the show because he couldn’t attend the Mass and his daughter had commented on how many hugs the newly ordained received from the other priests. His son remarked on how Cardinal Seán kissed their hands. Fr. Roger’s ordination anniversary will be later this summer after 12 years in the priesthood and has participated in many ordinations since then. In his own ordination, receiving Christ’s peace from so many priests he knew and looked up and who were his heroes was moving. Many of them whispered congratulations to him, calling “Father” for the first time. He now does that for all newly ordained and says a special pray for them. Then Scot played a series of taped comments from the newly ordained themselves recorded at the Mass. They were asked what it’s like to be laying prostrate at the altar and what the most poignant moment is for them. They spoke of the power of the Litany of the Saints, to be reminded of the whole Church in heaven and on earth that is praying for them. Fr. Roger talked about what it was like to lay prostrate during the Litany of the Saints at his ordination Mass. He said a priest never forgets that experience. He still remembers the smell of the carpet and the dust on the floor. In the old rite, the man would be covered in a funeral pall to remind him that he was dying to himself and that he was being reborn in Christ. Scot asked him what is the exact moment he becomes a priest and Fr. Roger said there are two parts. The prayer is the form of the sacrament, in which the Holy Spirit is called upon, and then the second moment is when the hands of the bishop are imposed on the man. Just like in the Eucharist you need both the bread and wine and the words of consecration. The hands are the matter and the prayer is the form of the sacrament, to use theological language. Another recording, from Fr. Murphy who said he felt strongly the power of the Holy Spirit when the hands were laid upon him. Susan said it’s touching to hear them talk about their experience and speaks to the timelessness of the Church. 3rd segment: There has been a lot of secular coverage about the closing of the parish school at St. Mary of the Assumption in Lawrence. The pastor decided to close the school and a lot of the families tried to raise money to save the school. They thought if they raised enough it would keep the school afloat. To date they have raised more the $300,000, but the actual debt of the school to the parish and archdiocese exceeds $600,000 and the money is in the form of pledges. It would not begin to repay the debts and would not contribute to sustainability for the parish. Scot said it’s sad when there is confusion over who makes the decisions and when anger is misdirected. Susan said no one wins in this situation. This points to how much we cherish our parishes and parish schools. This effort of raising money has been tried in other communities and they have not fared well. Scot said it’s tough for him to follow the secular coverage and see how much misinformation is out there. The schools in any inner-city need a lot more money to operate than back in the day when there were religious to staff the schools. In Lawrence, there was a huge effort to consolidate three schools into Lawrence Catholic Academy. For various reasons, St. Mary’s chose not to participate. The Catholic School Foundation wanted to help the new academy get a good start and chose not to direct funds to St. Mary’s. Without that support, it became unsustainable. The $300,000 pledged might help it for one year, but what would happen in following years. The secular media implied that Cardinal Seán had promised that if the parents had raised $250,000 they would stay open, but that did not happen. In the end, the parish does not want to be on the hook for the debt of the school, nor did the Augustinian order which staffs the school or the archdiocese. Fr. Roger went through a school closing at St. Anthony in New Bedford. He said it was one of the toughest things he had done in his life, closing an institution with such history but was also a beacon of hope for so many kids and families. As Catholics our catholicity needs to be more than our ethnicity or our parochialism. There is still opportunity for Catholic education for these children. Even if the school closes, our Catholic faith will be passed on to the next generation. While we can mourn, the sun still shines for those hoping to receive the great treasure of our faith. Let’s not focus on what we’re losing, but on what we still have. On May 21, there was a connection between Pope Benedict in the Vatican and the astronauts on the space station. One of the astronauts is Mark Kelly, the husband of US Rep. Gabrielle Giffords who was injured in a shooting in January. Gregory said it’s a great story, the Pope talking to people out in the heavens. The Pope asked Kelly how this mission can advance the cause of world peace and Kelly answered that the mere fact that this international effort exists shows people can live and work in harmony. The Pope asked astronaut Ron Garan what he could see from space on earth that needed attention. He replied: “To think that this paper-thin layer is all that separates every living thing from the vacuum of space and is all that protects us, is a really sobering thought.” Scot said he thought of how marvelous is God’s creation, to see it from space. Italian astronaut Roberto Vittori had met with the Holy Father before his trip and in this visit he showed him a coin with the image of the Sistine Chapel painting and Vittori showed off weightlessness by flipping the coin around. Fr. Roger said the other Italian astronaut Paolo Nespoli’s mother had died a couple of days before and the Holy Father said he was praying for him and asked him how he was coping with this loss. He told the Holy Father that he felt his prayers before and now and that it has been a comfort. The Holy Father had shown himself to be a pastor to these astronauts in space. 4th segment: Producer Rick Heil recounted meeting astronaut Ron Garan, who is a fellow graduate of SUNY Oneonta. Fr. Roger’s editorial in The Anchor this week analyzes the John Jay College report on the causes and context of the sexual abuse scandal. The secular media often does the most sensationalist reporting and then moves. Fr. Roger this week looked at the first three chapters of the report, which looked at how sexual abuse has occurred in other places in society. Part of the goal is to show that facile explanations such as saying that celibacy was the cause can be debunked. The second chapter looked at the historical context, how abuse peaked between the mid-1960s and 1980s and how there’s no single cause for abuse, but that’s interesting it peaked during this time. The secular media claimed the Church was trying to blame the Sixties and the sexual revolution, but the report was saying that men in the seminary were not receiving an adequate human formation in their sexuality and when they encountered the changes in society, they began to follow the prevailing winds of society. The third chapter fills in the gaps in the crisis that haven’t been studied because it looks at psychology. The report noted that many bishops recommended the abusers go for psychiatric examination and the prevailing view in the field thought these men could be cured. In essence they were overselling their competence and claimed to be doing what history shows us can’t be done. We find now that we don’t even have reliable predictors of this behavior. Fr. Roger said it helps explains why bishops were a little too credulous with the recommendations of the psychiatric profession. Next week he will focus on the extent to which homosexuality played a role in the crisis. Scot said he’s seen that most people want one clear answer to the crisis, but the report says there just isn’t one answer. The tendency of the secular media is to oversimplify complex problems. There’s a joint statement from the Daughters of St. Paul and the Archdiocese resolving the disagreement between them over pension funds held by the Archdiocese for lay employees of the Daughters. In The Anchor this week is a story about a bill before the Mass. Legislature that would lower the age of parent consent to 16 for girls to acquire an abortion. Fr. Roger said he also has an article on end of life issues and how to approach these issues from a Catholic perspective. Not only does it ask the right questions, it gives some concise answers. Gregory noted the story on the Catholic Charities spring fundraising event, which raised a record amount. The highlight of the story is the inspiring story of a Dominican immigrant who says she was saved by Catholic Charities. Notre Dame’s Father Hesburgh was also honored by Catholic Charities at the dinner. The Anchor also has a cover story on the centennial anniversary of St. Anthony Parish in Fall River.